It's late at night. The house is quiet, and everyone is sleeping peacefully, even the cat. Suddenly there is an ear piercing shriek, that turns into prolonged screaming. You sit bolt upright and leap out of bed, adrenalin racing, your heart beating so fast you can feel it. You look into your child's bedroom and check for intruders. Gingerly you go in and see your beloved little one bolt upright screaming, their eyes wide open. Whatever is the matter? The fabulous Kate at Kate Takes 5 has started something amazing, answering problems that other parents are having with their children. She has been asking around for people to contribute to dilemmas that she hasn't had experience of herself, or is looking for a different perspective. When she asked for someone to write about Night Terrors I immediately responded, as we have been on quite a journey with night terrors. Emily at Family Four Fun is having problems with Master E and night terrors. You can read all about it here. Master E sounds very much like Joseph, and I'm happy to share our experience. I am no expert, or oracle but here goes. What is a night terror? Night terrors are part of a broader range of disorders called parainsomnia. Parainsomnia is basically just a term for abnormal activites that occur during sleep, and covers other issues like sleep walking, sleep talking etc. What happens in a night terror? Here lies the inherent difference between a nightmare and a night terror. Nightmares occur in REM sleep, that lighter sleep where the imagination goes on flights of fancy. Night terrors occur in the deepest, dreamless sleep. So this is the main difference. The upshot of this is that a nightmare is remembered, and a night terror is not. In a night terror the child may appear awake. In our case Joseph's eyes are nearly always wide open. The screaming is loud and incessant. But its important to remember the child is still asleep. And although the rest of the house is awake, the child is still getting refreshing sleep even though it doesn't seem like it. What action should I take? In all the reading I have done, the advice is the same. Do not wake the child. The child is still asleep, and although it sounds horrifically frightening, they will have no recollection in the morning of their nocturnal activity. You can try patting them or soothing them, but this is for your benefit as a parent, not the childs! The best thing to do is calmly wait for it to finish. If you wake the child, they may become agitated, or frightened by your own reaction, and importantly they will be awake, and missing out on sleep. One of Emily's questions was whether to question Master E to find out what is causing him stress and worry. Night terrors occur in deepest sleep so may not be related to any specific concerns. They can occur in times of high anxiety, I had a few episodes when Joseph was in hospital, but can occur at any time. Why do some children get night terrors? That is a really good question, and sleep is still largely a mystery to researchers. There is some evidence to say they tend to run in families.But its not purely genetic as not all children in the same family will get them. I get them from time to time, as did my maternal grandmother. Sometimes things can trigger them, like teething, post nasal drip and underlying medical conditions . They can also occur at times of bursts of development. 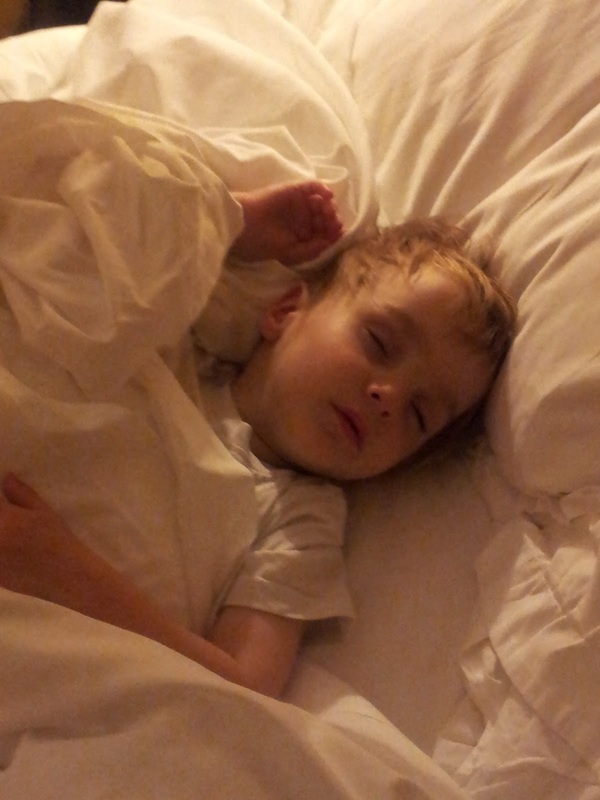 Joseph learnt to sleep crawl during a night terror before he could actually crawl whilst awake! This is happening often and disturbing the household is there anything I can do? Try keeping a sleep diary, from evening meal onwards for a couple of weeks. Note the time the episodes occur, anything that is going on that is outside the norm. Some doctors advise waking the child before the terror occurs. In our case Joseph would wake at 2am each night, so you can try waking say at 1.45 with a drink and resettling. This should then send them into REM sleep and the night terrors may not occur. It's not foolproof, but its worth a try. If they persist then go and see a doctor, taking your diary with you. More often than not night terrors will go of their own accord, but it's helpful to get anything underlying ruled out. In our case the night terrors were put down to post nasal drip, where the snot runs into the back of the throat. Once we used a saline nasal spray before bed, they tended to settle down. In older children hayfever can cause postnasal drip so an antihistamine at bed time could be something to try. Nocturnal asthma can also cause confusional arousal/night terrors. When will they stop? I have found that night terrors come and go. Joseph hasn't had one for a while, but he does sleep walk, and sleep talk as well. The sleep talking is a lot funnier than the night terrors! They might disappear completely, change into another parainsomnia disorder, or carry on. It's important to remember that the child is not upset by these and has no recollection. I hope that's proven to be somewhat helpful, and thanks again Kate for asking me to write this post. Great advice Kylie. We actually had a few incidents of what I can only assume were night terrors when my son started in creche. It completely freaked me out. He appeared to be wide awake - but it was obvious he wasn't seeing anything. And he was just screaming crying. We woke him each time it happened, which I now know was not the best approach to take. But at the time, I really didn't have a clue what was happening. Interesting that it runs in families, because my husband used to get night terrors too, right up to his teens. Thankfully he doesn't any more. And thankfully our son hasn't had any in over a year now, so hopefully he won't be prone to them anymore. My daughter (aged 3 1/2) has had a few of these. At first I tried to hold her or calm her down but then I realized what it was. So now if it happens, I climb into bed with her and just lie there with my hand on her (so I feel I'm offering some support) and wait for it to end. It's good to read that this is normal though. And the talking in her sleep is very funny as you say. Great idea. Fortunately my 4 year old hasn't suffered night terrors yet, but is good to read about it and know what to do if it happens. My youngest son has suffered with night terrors since he was around the age of 2. Thankfully we don't seem to have had an incident for about 12 months now, so I am hoping we are out of the woods now - he has just had his 13th birthday! I have been dealing with his night terrors for a long long time, and I have to say that NOT waking him up has never been an issue - quite simply if I did not aim to wake him at least enough to come out of the terror, he would be screaming for the whole of the night - there would be no let up. Not only would he scream, he would charge around the house in his sleep like there was some kind of demon after him. He can talk to you and hear you, but his aim is always the same - he has to get himself and me out of the house! I learned over the years that whilst he appears to actually be talking to me - he has no idea that I am Mummy. I don't know who I am in his terror, but I am not me. He however is still himself and this is something I have used to help get him out of the depths and back to a point where he can be calmed and have restful sleep! The first thing I have always done is lift him out of bed (if he hasn't gotten up and is running around) and get him onto the toilet. Yep from the age of 2 to 12 I have been putting my son on the toilet in his terrors! Once I have him on the toilet I start my mantra "Go away nasty dream, leave my Henry alone" I repeat this over and over again, while pinning my son to sit on the toilet. Eventually he will start to wee, and this I have found is the key - for us at least! In order to wee he needs to relax his body enough to allow himself to wee, when he relaxes just that bit so he can wee he can hear my voice telling the nasty dream to go away (or at least thats how it seems) I carry on with my single line and ask him to say it too - eventually he will start to repeat the line with me. He shouts "Go away nasty dream, go away nasty dream" We usually carry on like this for at least 30 minutes, but sometimes it can be an hour or even more. Henry slips further down then back up the rabbit hole, until eventually he will surface enough for him to know that I am there, and I know at that point we have won. It's amazing how quickly you learn what your child can and can't see when in the grip of a terror, and how as a parent you can spot even the minutest details in their eyes that let you know how far down the rabbit hole they actually are. The other thing that I have noticed over the years of dealing with my own son, but also in working with children in general. Many children who suffer from night terrors, seem to come back out of the hole a lot quicker if they are lifted and sat on the toilet! Perhaps the terror stems from their holding themselves when they need to wee - I think we all know from bitter experience that the pain you can get in your tummy from holding a wee can be really unbearable, and often when you later try to wee, your muscles are not able to relax to the point of letting your bladder open, and I truly believe that this could have something to do with it. Who knows! I hope my advice helps someone. I've told lots of people over the years how I have always dealt with Henry's terrors and several have come back to me and said that similar things have worked for them too - so maybe there is something in it. Great post Kylie - Meg also has night terrors so it's good to know it's not unusual. I learned through trial and error that touching her or trying to wake her just made the whole thing worse as she has no concept who we are in her terror. We always have the same thing - there are spiders in her hair and in her bed. I always thought it must be linked to some kind of experience she'd had during the day with a spider but it's interesting to think it could be completely unrelated. We found that if Meg gets overheated during the night that it sets them off so we have to keep her bedroom extremely cool. Funny how there are different triggers. Once, when i was six,my mother awoke to find i wasnt in my room, or even in the house. she eventually found me in the car asllep on my lunch box...i'd sleepwalked there! bizarre.